I sometimes wonder how many beer festivals and related events can be shoehorned into the summer calendar. Apparently we don't yet have enough of them. If we did, the ongoing barrage of new stuff might be slowing down. It isn't. One of this year's newcomers is Pints in the Pearl, set for an inaugural engagement on June 4. The event is the brainchild of the Pearl District Business Association, whose mission is to promote the Pearl District. Fulfillment of that mission evidently means giving the area the beer festival it never had. Alright. The host breweries are Bridgeport, Deschutes, 10 Barrel and Fat Heads. Each will operate a station serving three or more beers, including one made just for the event, along with food items. Brewery staff will be present, allowing attendees to possibly chat about how the various beers were created. 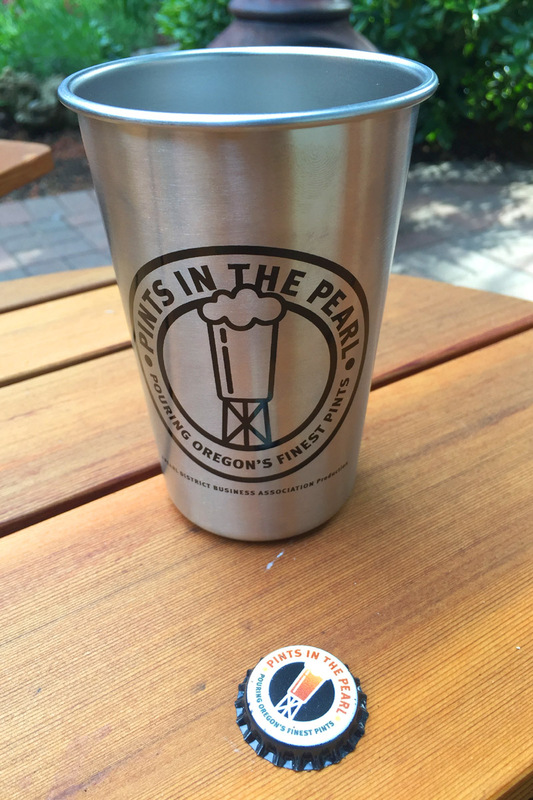 Pints for the Pearl is a bit of an oddity, for sure. Instead of your standard festival tasting mug or glass, they're handing out a stainless steel pint glass. And each token gets a full glass of beer, which flies in the face of the tasters present at most events of this kind. Your $20 admission includes the "limited edition" souvenir glass and three tokens. Each token is good for a 16 oz beer or one food item. Additional tokens will be $5 apiece. Tickets are available in advance on he company website here. Along these lines, they will only accept credit and debit cards at the event. Slightly odd, right? 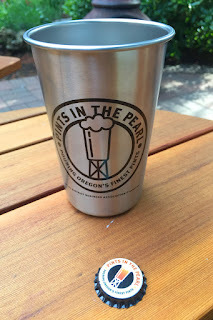 In addition to beer and food tasting, Pints in the Pearl will feature family friendly entertainment ranging from corn-hole to live music by artists including The Weather Machine and local American Idol contestant Haley Johnson. Organizers say the event is open to all ages and they hope to attract several thousand folks. I suppose it's fitting that the Pearl District, the birthplace of craft beer in Oregon, should host an event like this. I can recall Bridgeport putting on shindigs back when the roads were unpaved and the potholes were big enough to swallow a Volkswagen. Times have obviously changed in the so-called Pearl, but craft beer continues to play an important role here. A small group of grubby media types sampled some of the beers that will be poured at the event. Most of the beers are standards of the four breweries, but each brewery is offering at least one special beer. Your choice is to play it safe with a standard or take a chance on something special. Go to the website for more information location and times. There's also a Facebook page here.